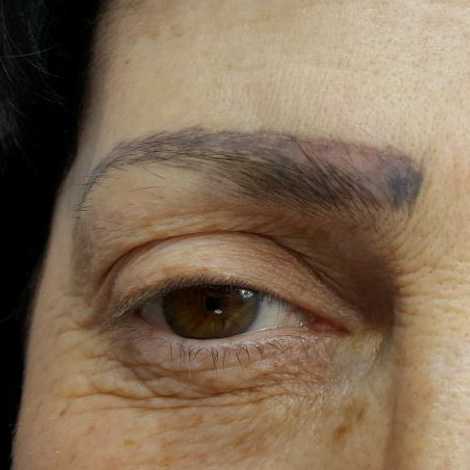 Removal of Microblading is difficult but possible! The microblading wave started about 5 years ago in Europe and has spread epidemically throughout the world. Meanwhile, this ancient Asian tattoo method is offered in hairdressing salons, nail salons and of course in private beauty rooms. The “training” and the purchase of necessary work equipment is relatively cheap and therefore affordable for everyone. The sudden popularity of this permanent make-up style has a reason, which is also the biggest problem at the same time. Namely, the eyebrows look incredibly good right after the treatment. The hairs carved into the skin are initially very thin (often even thinner than the own eyebrow hair) and also have a beautiful pattern. The skin responds to any injury with the immediate cure attempt, by any means. And the first means is namely the formation of connective tissue in order to close the skin barrier as quickly as possible. The microblading cut is filled with a so called „survival cementing substance“ to restore the protective barrier to the outside. 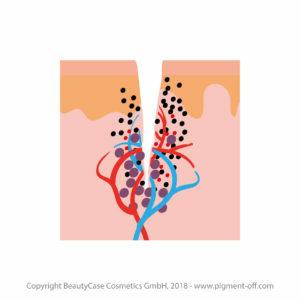 Since the „cementing substance“ consists of connective tissue, a scar is formed at the injured skin area. 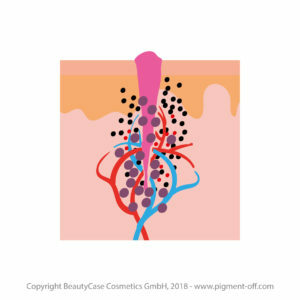 This happens each time the injury has penetrated into the middle to deep dermis layer of the skin. After the healing, the skin is then provided with miniscars at the injured areas, which corresponds to a normal physiological healing process. You can compare it very well with a broken vase that has been repaired with superglue. From the distance, the vase looks good, but nearby you can see and feel the sticky spots. are also settled in the scars. the sticky spots (=scars) are there forever. 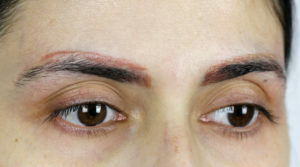 In the worst cases (and we see more and more of them, according to the growth of the Microblading Army), the cuts were set so deep that the pigments in the skin migrated heavily and have become blue-gray. Unfortunately, the number of such cases grows every day. In the last time, the consequences of microblading become more and more conscious. It gets around, how the whole thing after the healing or with the time looks like and more and more women and men are no longer blinded by the marketing images of the freshly made work. But at the same time, a lot of people still believe the beautiful pictures of fresh done works and have to live with disfigured faces after the healing process. The main problem is that even today it is not so easy to remove or correct microblading. I’ll explain why. 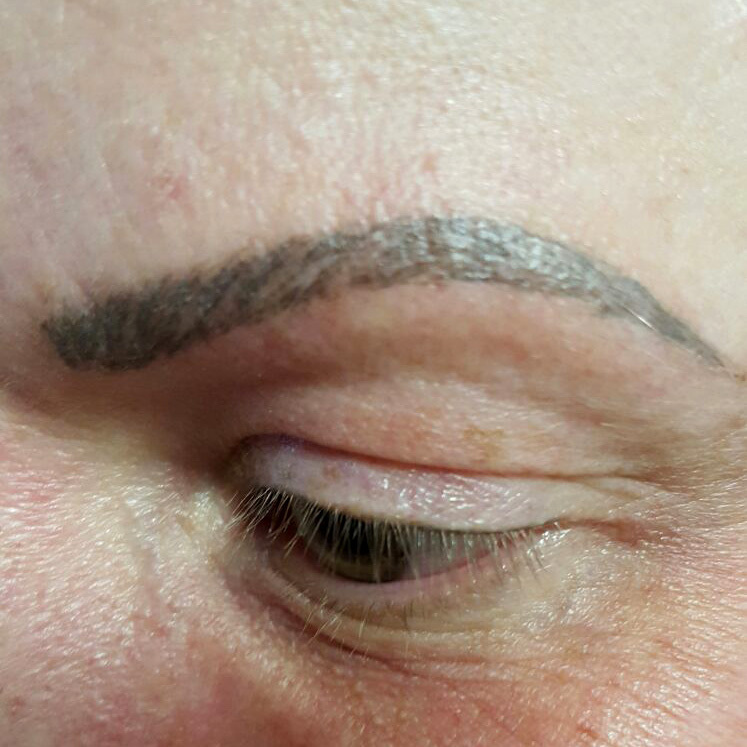 If microblading is done relatively superficially, it will fade by itself after a few skin regeneration cycles. Because the upper layers of skin are constantly renewed, every 28-30 days, the epidermis layer is almost completely replaced by a new one. It becomes problematic when pigments have manifested in the miniscars. 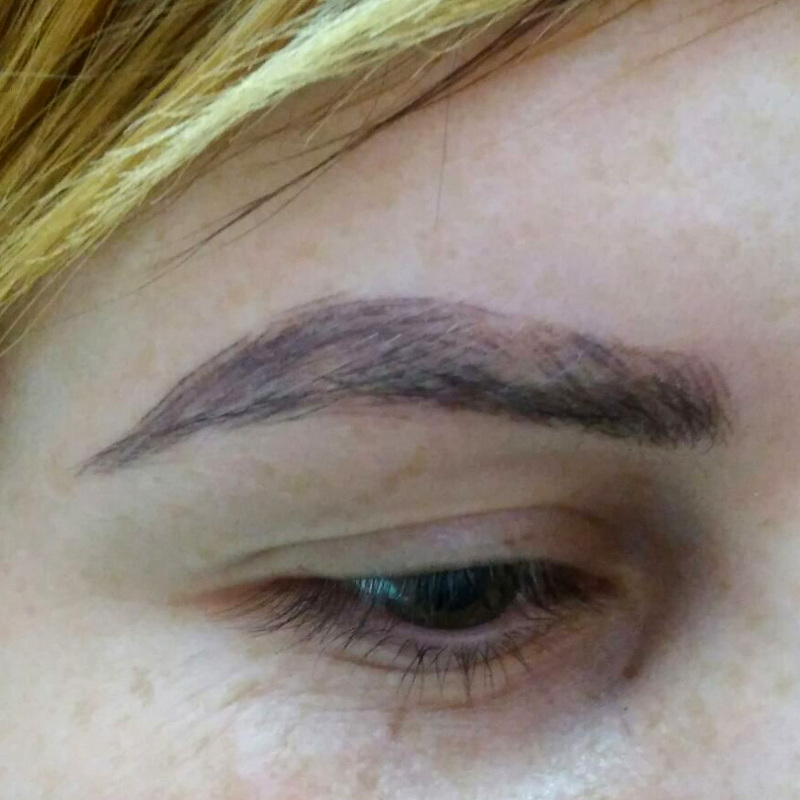 In this case, the tattoo (and microblading is nothing else than a manually performed tattoo!) just will NOT fade. Not after a month and not after a year. Not after 2-3-4 years. Because the pigments sit firmly in the skin and can not leave it. Many “victims” think first of laser removal. Sometimes it works. More often these attempts fail and only worsen the situation. Why? 1. 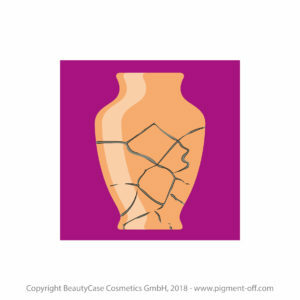 When the used pigments are based on acrylic, they melt under the laser beam and lead to internal skin burns and thus to further scars. 2. When the pigments are synthetic, the laser often can not detect them. 3. 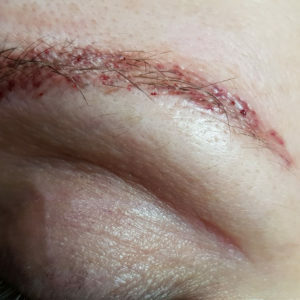 The worst thing, however, is that the mini-cuts reopen under the laser beam, which is accompanied by massive blood leakage and further scarring. Also correction attempts (so-called CoverUp’s) fail in most cases. First, you can not correct the gray-blue blurry lines to look natural and beautiful. It will just look “dirty” and the old pigmentation will always “look through”. And secondly, the cuts / scars open in the correction attempts as well as during laser removal, which can further traumatize the skin. 1. 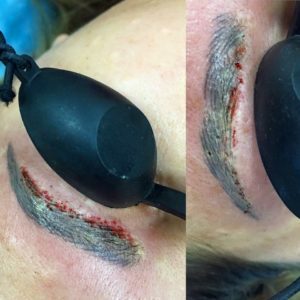 Do not attempt to remove scarred microblading with a laser. 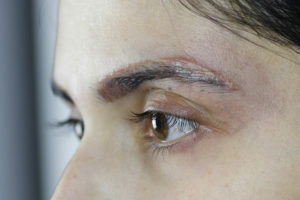 The risk of internal burns, color changes and other scarring is too big. 2. 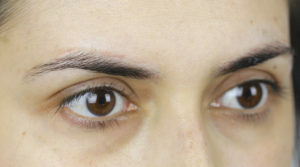 Any correction is only useful if the microblading is very pale and not accompanied by scars. If it is too dark / too deep, it should first be removed or lightened. 3. 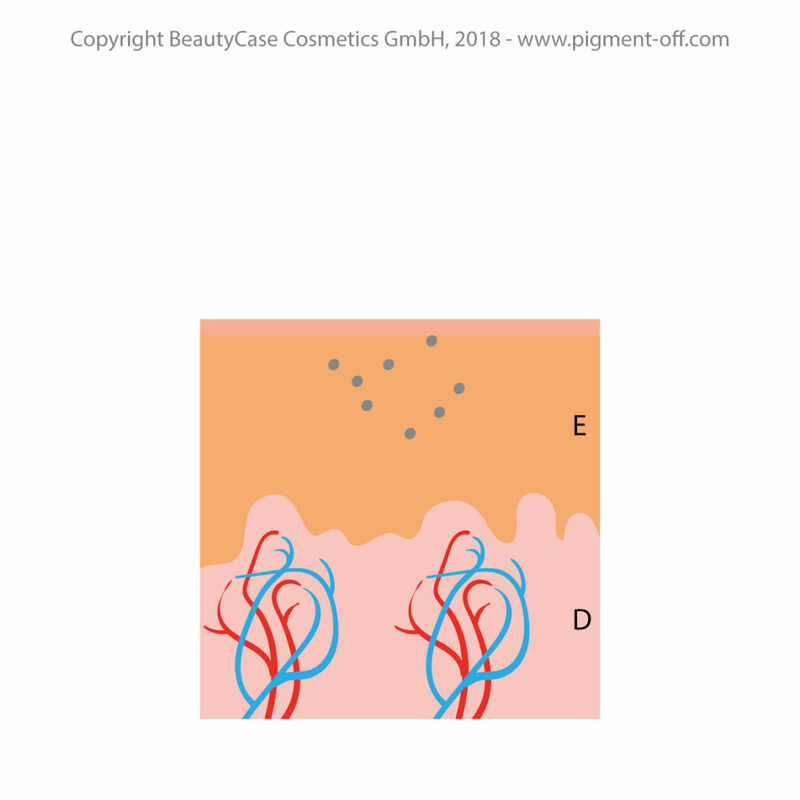 The most effective and safest method of removing microblading at present is the removal of pigments through skin surface without severe trauma to the cuts / scars. 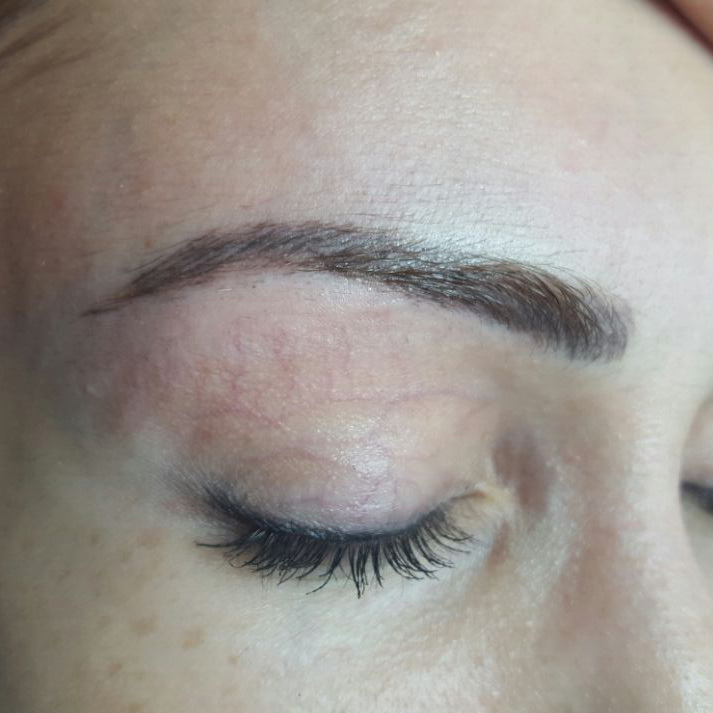 In the BeautyCase Academy we developed a special method for the removal of failed microblading. 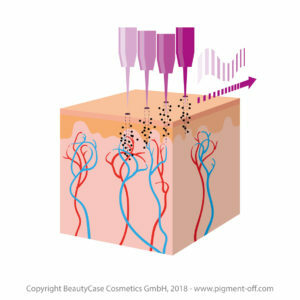 The unique removal technique with the innovative PigmentOff-Remover allows the stabilized pigments to be gently brought to the skin surface without reopening the cuts. The special home care products accompany the subsequent healing and support the skin regeneration. 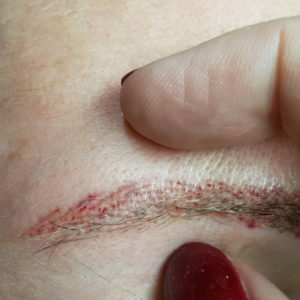 And the best news: the scarred skin tissue becomes smoother and softer so that after regeneration time, minimal or no microblading effects are seen, which is so important to so many clients who want to get rid of it. and inflammations in the skin. finally gone, scars have become flat and barely visible. More information: mode of action and composition. 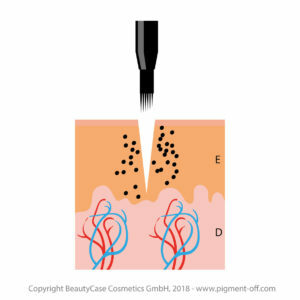 With the remover method, the pigments are removed from the skin in a similar way as they were implanted earlier. That means, they are carried to the skin surface and do not remain in the body. When performed professionally, this method is fast, non-scarring and very effective, as pigments of all types and colors can be removed. All photos and drawings are protected by copyright! Copying is strictly prohibited.